5 German Center for Cardiovascular Research (DZHK), Berlin Institute of Health (BIH), Berlin, Germany. First published by Oxford University Press on behalf of the European Society of Cardiology in European Heart Journal [Eur Heart J. 2016 Feb 7;37(6):510-9]. Translated with permission. All rights reserved. © The Author 2016. For permissions please email: journals.permissions@oup.com. antibodies targeted to proprotein convertase subtilisin/kexin type 9 (PCSK9) in markedly reducing levels of low-density lipoprotein cholesterol (LDL-C) across a spectrum of patients at high risk of premature CVD, with preliminary fi ndings strongly suggestive of reduction in cardiovascular events; (vi) signifi cant reduction of cardiovascular and all-cause mortality in diabetic patients in the EMPA-REG OUTCOME trial with the anti-hyperglycaemic agent, empagliflozin, a selective sodium-glucose co-transporter-2 (SGLAT-2) inhibitor; (vii) new pharmacotherapeutic strategies for superior control of hypertension emanating from the PATHWAY-2 and PATHWAY-3 clinical trials involving spironoloactone add-on therapy in resistant hypertension, and amiloride plus hydrochlorothiazide in hypertensive patients requiring a diuretic, respectively; and finally (viii) a reduced mortality associated with a lower blood pressure target of 120 mmHg in patients at high cardiovascular risk in the SPRINT trial. Considered together, such progress augurs well for the future control of dyslipidaemia, hyperglycaemia, and hypertension, and with it, progressive reduction in atherosclerotic vascular disease and associated cardiovascular events in high-risk patients. 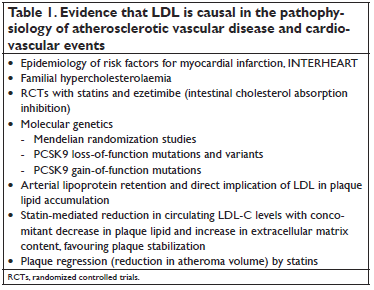 this context, it is especially relevant that recent genetic findings, involving Mendelian randomization strategies which integrate lifelong and therefore cumulative risk exposure, have consolidated the evidence base for a causal role of LDL in the pathophysiology of atherosclerosis and CVD7-9 (Table 1). Moreover, the IMPROVE-IT trial10 has now demonstrated that a mechanism of LDL lowering distinct from that of statins translates into clinical benefit. Ezetimibemediated inhibition of intestinal cholesterol absorption yielded incremental lowering of LDL-C on a background of statin treatment in this trial (involving 18 144 patients hospitalized for an ACS over 7 years) and translated into moderate improvement in cardiovascular outcomes, i.e. a 7.2% lower rate of major vascular events. Baseline levels of LDL-C were low (1.8 mmol/L or 70 mg/dL), with a 24% further reduction when ezetimibe was added to simvastatin; that cardiovascular benefit is proportional to the degree of LDL-C reduction is of critical relevance in this context.11 Cardiovascular mortality was not modified, a finding which may result from several factors, and particularly the need for post-trial, long-term follow-up data on clinical benefit. Indeed, it is increasingly evident that such follow-up reveals legacy benefits of LDL lowering eyond the active intervention period in randomized, placebocontrolled statin trials, typically featuring decrease in cardiovascular death rates.12 Clearly then, a new paradigm is appearing in which LDL lowering therapies may alter the pathophysiological course of atherosclerotic vascular disease and its thrombotic complications, potentially by inducing lesion stabilization, or lesion regression, or both. In this condensed distillate of advances in prevention of CVD over the past year, three key areas standout. First, the evolution from emphasis on the ruptured, vulnerable coronary plaque to coronary plaque erosion in the context of ACS, with immediate rele vance to approaches searching for ‘vulnerable’ plaques. 13 Second, the appearance of advanced molecular methodologies for identification of biomarkers with potential for high predictive value.14 Third, the advanced development, based on the molecular genetics of familial traits for cholesterol dysmetabolism associated with premature atherosclerosis, of monoclonal antibodies targeted to PCSK9 for marked reduction in LDLC levels.15 Importantly, progress in all three areas holds great promise to positively impact the care pathway for patients at high risk of CVD. that a substantial proportion of patients with incident CHD are hypo-responders to statin therapy, show minimal LDL-C reductions, and most importantly, greater atheroma progression as compared with responders.27 Under such circumstances, follow-up monitoring of LDL-C levels after initiation of statin becomes primordial to ensure goal attainment. profile.15,33-35 As exemplified by alirocumab, these antibodies act in vivo primarily by accelerating the fractional catabolic rate of LDL.36 An alternative approach to reduction of plasma PCSK9 concentrations involves direct inhibition of its hepatic production. Figure 1. Statin-associated muscle symptoms predominate as adverse effects among dyslipidaemic subjects who discontinue statin treatment. 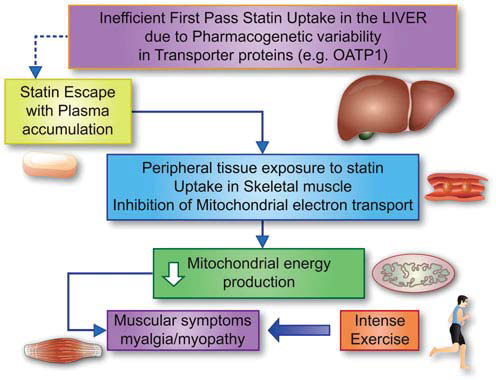 Available evidence suggests that the pathophysiological basis for statinassociated muscle symptoms arises from ineffi cient uptake of statins by the liver, i.e. ‘statin escape’, frequently as a result of genetically determined variation in the structure of organic anion transporter proteins, such as organic anion transporting polypeptide 1 encoded by the SLCO1B1 gene. Thus, variant forms of the protein may exhibit low binding affinity for the statin. Under these conditions, fi rst-pass hepatic uptake of the statin is incomplete, leading to elevated levels of statin in the circulation with prolonged residence time. At high statin doses, accumulation of statins in plasma correlates with a poor low-density lipoprotein cholesterol lowering response and a distinct trend to increased frequency of statin-associated muscle symptoms and myopathy.25 As a consequence, peripheral tissues such as skeletal muscle are exposed to high statin concentrations with the potential for enhanced uptake; several mechanisms appear to contribute to statin-induced reduction in ATP production and mitochondrial function in muscle cells.25 High demand for energy production in muscle, as occurs in intense exercise, may potentiate statin-associated muscle symptoms. albeit involving a distinct dosing regimen from that above for alirocumab39; furthermore, additional novel trial data have recently been reported in FH homozygotes in the TAUSSIG and TESLA trials (comprehensively reviewed by Chapman et al.15). low LDL’, however, LDL may be effectively absent from plasma, and thus the readout potentially corresponds to Lp(a) cholesterol; the clinical implications of this concept are indeterminate.51 Under these conditions, ultracentrifugal isolation of LDL provides an accurate readout. exerts cumulative, long-term arterial benefit, modifying the pathophysiological trajectory of atherosclerotic vascular disease.12 Therefore, critical appraisal of these agents should integrate their cumulative, long-term health benefits both for the individual and potentially for healthcare systems. 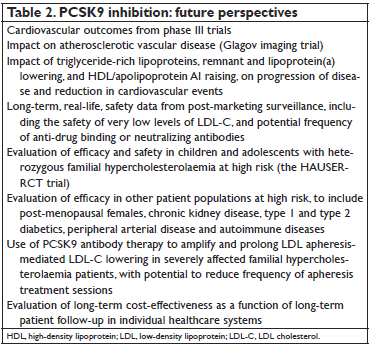 In this light, we summarize future perspectives for PCSK9 inhibition in Table 2.
impact components of the atherogenic lipid profile beyond LDL-C, including triglyceride-rich lipoproteins and remnants (TGRL); such action may equally modulate levels of both high-density lipoprotein (HDL) and apolipoprotein (apo)AI via intravascular remodelling mechanisms. cholesterol; LDL-C, low-density lipoprotein cholesterol. After numerous cardiovascular outcome studies over the past years in patients with diabetes, suggesting no short- and medium-term risk reduction with anti- hyperglycaemic agents, the EMPA-REG OUTCOME trial reported a signifi cant reduction of cardiovascular and all-cause mortality using a selective SGLAT-2 inhibitor, empaglifl ozin in patients with type 2 diabetes at high cardiovascular risk.71 These observations will have a significant impact on the future management of cardiovascular prevention in patients with type 2 diabetes. at 6 months,74 raising hope that renal denervation may lower blood pressure in well-selected patients. Importantly, the SPRINT study75 demonstrated that among patients at high risk for cardiovascular events but without diabetes, targeting a systolic blood pressure of <120 mmhg=”” as=”” compared=”” with=”” 140=”” mmhg=”” br=””> resulted in lower rates of fatal and non-fatal major cardiovascular events and death from any cause, although signifi cantly higher rates of some adverse events were observed in the intensive-treatment group. This trial was larger than the previous ACCORD study, where a trend for a lower rate of cardiovascular events was observed with more intensive blood pressure lowering. SPRINT studies have provided valuable insights into optimization of treatment. Ingelheim, Medtronic, Pfizer, Roche, SIEMENS Diagnostics, SIEMENS, Thermo Fisher and as member of Advisory Boards and for consulting for Boehringer Ingelheim, Bayer, Novartis, Roche and Thermo Fisher. 1. Townsend N, Nichols M, Scarborough P, Rayner M. Cardiovascular disease in Europe—epidemiological update 2015. Eur Heart J 2015;36:2696–2705. 2. Perk J, De Backer G, Gohlke H, Graham I, Reiner Z, Verschuren WM, Albus C, Benlian P, Boysen G, Cifkova R, Deaton C, Ebrahim S, Fisher M, Germano G, Hobbs R, Hoes A, Karadeniz S, Mezzani A, Prescott E, Ryden L, Scherer M, Syvänne M, Op Reimer WJ, Vrints C,Wood D, Zamorano JL, Zannad F. European Guidelines on cardiovascular disease prevention in clinical practice (version 2012). The Fifth Joint Task Force of the European Society of Cardiology and Other Societies on Cardiovascular Disease Prevention in Clinical Practice (constituted by representatives of nine societies and by invited experts). Eur Heart J 2012;33:1635–1701. 3. Reiner Z, Catapano AL, De Backer G, Graham I, Taskinen MR, Wiklund O, Agewall S, Alegria E, Chapman MJ, Durrington P, Erdine S, Halcox J, Hobbs R, Kjekshus J, Filardi PP, Riccardi G, Storey RF, Wood D. ESC/ EAS guidelines for the management of dyslipidaemias: the Task Force for the management of dyslipidaemias of the European Society of Cardiology (ESC) and the European Atherosclerosis Society (EAS). Eur Heart J 2011;32:1769–1818. 4. Avanzini F, Marzona I, Baviera M, Barlera S, Milani V, Caimi V, Longoni P, Tombesi M, Silletta MG, Tognoni G, Roncaglioni MC; Risk and Prevention Study Collaborative Group. Improving cardiovascular prevention in general practice: Results of a comprehensive preventive strategy in subjects at high risk. Eur J Prev Cardiol 2015; pii:2047487315613664. [Epub ahead of print]. 5. Lachman S, Peters RJ, Lentjes MA, Mulligan AA, Luben RN,Wareham NJ, Khaw KT, Boekholdt SM. Ideal cardiovascular health and risk of cardiovascular events in the EPIC-Norfolk prospective population study. Eur J Prev Cardiol 2015; pii:2047487315602015. [Epub ahead of print]. 6. Yusuf S, Hawken S, Ounpuu S, Dans T, Avezum A, Lanas F, McQueen M, Budaj A, Pais P, Varigos J, Lisheng L; INTERHEART Study Investigators. Effect of potentially modifiable risk factors associated with myocardial infarction in 52 countries (the INTERHEART study): case-control study. Lancet 2004;364:937–952. 7. Catapano AL, Ference BA. IMPROVE-IT and genetics reaffirm the causal role of LDL in cardiovascular disease. Atherosclerosis 2015;241: 498–501. 8. Ference BA, Yoo W, Alesh I, Mahajan N, Mirowska KK, Mewada A, Kahn J, Afonso L, Williams KA Sr, Flack JM. Effect of long-term exposure to lower lowdensity lipoprotein cholesterol beginning early in life on the risk of coronary heart disease: a Mendelian randomization analysis. J Am Coll Cardiol 2012;60:2631–2639. polymorphisms in NPC1L1, HMGCR, or both: a 2 × 2 factorial Mendelian randomization study. J Am Coll Cardiol 2015;65:1552–1561. 10. Cannon CP, Blazing MA, Giugliano RP, McCagg A, White JA, Theroux P, Darius H, Lewis BS, Ophuis TO, Jukema JW, De Ferrari GM, Ruzyllo W, De Lucca P, Im K, Bohula EA, Reist C, Wiviott SD, Tershakovec AM, Musliner TA, Braunwald E, CaliffRM; IMPROVE-IT Investigators. Ezetimibe added to statin therapy after acute coronary syndromes. N Engl J Med 2015;372:2387–2397. 11. Cholesterol Treatment Trialists’ (CTT) Collaboration, Baigent C, Blackwell L, Emberson J, Holland LE, Reith C, Bhala N, Peto R, Barnes EH, Keech A, Simes J, Collins R. Effi cacy and safety of more intensive lowering of LDL cholesterol: a meta-analysis of data from 170,000 participants in 26 randomised trials. Lancet 2010;376:1670–1681. 12. Packard CJ, Ford I. Long term follow-up of lipid-lowering trials. Curr Opin Lipidol 2015;26:572–579. 13. Libby P, Pasterkamp G. Requiem for the ‘vulnerable plaque’. Eur Heart J 2015;36:2984–2987. 14. Hoefer IE, Steffens S, Ala-Korpela M, Bäck M, Badimon L, Bochaton- Piallat ML, Boulanger CM, Caligiuri G, Dimmeler S, Egido J, Evans PC, Guzik T, Kwak BR, Landmesser U, Mayr M, Monaco C, Pasterkamp G, Tuñón J,Weber C; ESCWorking Group Atherosclerosis and Vascular Biology. Novel methodologies for biomarker discovery in atherosclerosis. 15. Chapman MJ, Stock JK, Ginsberg HN. 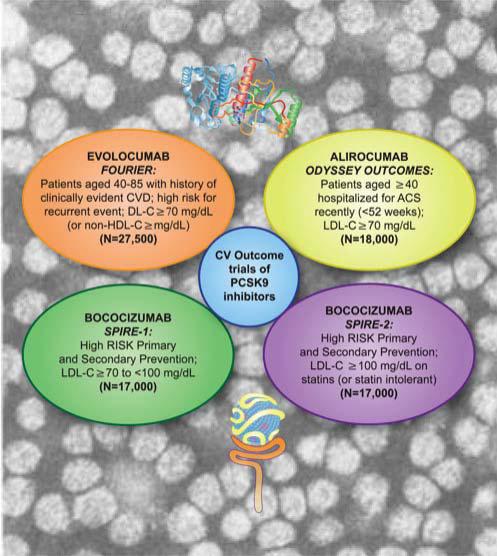 PCSK9 inhibitors and cardiovascular disease: heralding a new therapeutic era. Curr Opin Lipidol 2015;26:511–520. 16. Ferna´ndez-Friera L, Peñalvo JL, Fernández-Ortiz A, Ibañez B, López- Melgar B, Laclaustra M, Oliva B, Mocoroa A, Mendiguren J, Martínez de Vega V, García L, Molina J, Sánchez-González J, Guzmán G, Alonso- Farto JC, Guallar E, Civeira F, Sillesen H, Pocock S, Ordovás JM, Sanz G, Jiménez-Borreguero LJ, Fuster V. Prevalence, vascular distribution, and multiterritorial extent of subclinical atherosclerosis in a middleaged cohort: the PESA (Progression of Early Subclinical Atherosclerosis) Study. Circulation 2015;131:2104–2113. 17. Baber U, Mehran R, Sartori S, Schoos MM, Sillesen H, Muntendam P, Garcia MJ, Gregson J, Pocock S, Falk E, Fuster V. Prevalence, impact, and predictive value of detecting subclinical coronary and carotid atherosclerosis in asymptomatic adults: the BioImage study. J Am Coll Cardiol 2015;65:1065–1074. 18. Niccoli G, Montone RA, Di Vito L, Gramegna M, Refaat H, Scalone G, Leone AM, Trani C, Burzotta F, Porto I, Aurigemma C, Prati F, Crea F. Plaque rupture and intact fi brous cap assessed by optical coherence tomography portend different outcomes in patients with acute coronary syndrome. Eur Heart J 2015;36:1377–1384. 19. Iannaccone M, Quadri G, Taha S, D’Ascenzo F, Montefusco A, Omede’ P, Jang IK, Niccoli G, Souteyrand G, Yundai C, Toutouzas K, Benedetto S, Barbero U, Annone U, Lonni E, Imori Y, Biondi-Zoccai G, Templin C, Moretti C, Luscher TF, Gaita F. Prevalence and predictors of culprit plaque rupture at OCT in patients with coronary artery disease: a meta-analysis. Eur Heart J Cardiovasc Imaging 2015; doi: 10.1093/ ehjci/jev283. 20. Mega JL, Stitziel NO, Smith JG, Chasman DI, Caulfi eld MJ, Devlin JJ, Nordio F, Hyde CL, Cannon CP, Sacks FM, Poulter NR, Sever PS, Ridker PM, Braunwald E, Melander O, Kathiresan S, Sabatine MS. Genetic risk, coronary heart disease events, and the clinical benefit of statin therapy: an analysis of primary and secondary prevention trials. Lancet 2015;385:2264–2271. 21. Gerstein HC, Paré G, McQueen MJ, Haenel H, Lee SF, Pogue J, Maggioni AP, Yusuf S, Hess S; ORIGIN Trial Investigators. Identifying novel biomarkers for cardiovascular events or death in people with dysglycemia. Circulation 2015;132:2297–2304. 22. Zeller T, Tunstall-Pedoe H, Saarela O, Ojeda F, Schnabel RB, Tuovinen T, Woodward M, Struthers A, Hughes M, Kee F, Salomaa V, Kuulasmaa K, Blankenberg S; MORGAM Investigators. High population prevalence of cardiac troponin I measured by a high-sensitivity assay and cardiovascular risk estimation: the MORGAM Biomarker Project Scottish Cohort. Eur Heart J 2014;35:271–281. 23. Everett BM, Zeller T, Glynn RJ, Ridker PM, Blankenberg S. High-sensitivity cardiac troponin I and B-type natriuretic Peptide as predictors of vascular events in primary prevention: impact of statin therapy. Circulation 2015;131:1851–1860. 24. Everett BM, Brooks MM, Vlachos HE, Chaitman BR, Frye RL, Bhatt DL; BARI 2D Study Group. Troponin and cardiac events in stable ischemic heart disease and diabetes. N Engl J Med 2015;373:610–620. 25. Stroes ES, Thompson PD, Corsini A, Vladutiu GD, Raal FJ, Ray KK, Roden M, Stein E, Tokgözoglu L, Nordestgaard BG, Bruckert E, De Backer G, Krauss RM, Laufs U, Santos RD, Hegele RA, Hovingh GK, Leiter LA, Mach F, März W, Newman CB, Wiklund O, Jacobson TA, Catapano AL, Chapman MJ, Ginsberg HN; European Atherosclerosis Society Consensus Panel. Statin-associated muscle symptoms: impact on statin therapy. European Atherosclerosis Society Consensus Panel Statement on Assessment, Aetiology and Management. Eur Heart J2015;36:1012–1022. association studies of LDL cholesterol response to statins. Nat Comm 2014;5:5068. 27. Kataoka Y, St John J, Wolski K, Uno K, Puri R, Tuzcu EM, Nissen SE, Nicholls SJ. Atheroma progression in hyporesponders to statin therapy. Arterioscler Thromb Vasc Biol 2015;35:990–995. heart disease: consensus statement of the European Atherosclerosis Society. Eur Heart J 2013;34:3478–3490. 30. Fazio S. The role of PCSK9 in intestinal lipoprotein metabolism: synergism of statin and ezetimibe. Atherosclerosis Suppl 2015;17C:23– 26.
by optimizing detection and treatment. Eur Heart J 2015;36:2425– 2437. 32. Ballantyne CM, Neutel J, Cropp A, DugganW,Wang EQ, Plowchalk D, Sweeney K, Kaila N, Vincent J, Bays H. Results of bococizumab, a monoclonal antibody against proprotein convertase subtilisin/kexin type 9, from a randomized, placebocontrolled, dose-ranging study in statin-treated subjects with hypercholesterolemia. Am J Cardiol 2015;115:1212–1221. 33. Dadu RT, Ballantyne CM. Lipid lowering with PCSK9 inhibitors. Nat Rev Cardiol 2014;11:563–575. 35. Food and Drug Administration Center for Drug Evaluation and Research. The Endocrinologic and Metabolic Drugs Advisory Committee Meeting. June 10, 2015. Briefi ng document. Repatha (evolocumab) injection. http://www.fda.gov/downloads/AdvisoryCommittees/ CommitteesMeetingMaterials/Drugs/EndocrinologicandMetabolicDrugsAdvisoryCommittee/UCM450072.pdf (3 November 2015). 36. Reyes-Soffer G, Pavlyha M, Ngai C, Thomas T, Holleran S, Ramakrishnan S, Karmally W, Donovan D, Cowan L, Sasiela W, Surks H, Rey J, Poitiers F, Ginsberg HN. Effects of a proprotein convertase subtilisin/ kexin type 9 (PCSK9) inhibitor, alirocumab, on lipid and lipoprotein metabolism in healthy subjects. Circulation 2015;132:A18390 (abstract). 37. Fitzgerald K, Kallend D, White S, Borodovsky A, Sutherland J, Bettencourt B, Clausen V, Wijngaard P, Horton J, Simon A. A phase 1, randomized, placebocontrolled, single ascending and multiple dose study of subcutaneously administered ALN-PCSSC in subjects with elevated low density lipoprotein cholesterol. Eur Heart J 2015;36(Abstract supplement):309. 38. Shimada YJ, Cannon C. PCSK9 (proprotein convertase subtilisin/ kexin type 9) inhibitors: past, present, and the future. Eur Heart J 2015;36:2415–2424. 39. Raal FJ, Stein EA, Dufour R, Turner T, Civeira F, Burgess L, Langslet G, Scott R, Olsson AG, Sullivan D, Hovingh GK, Cariou B, Gouni- Berthold I, Somaratne R, Bridges I, Scott R, Wasserman SM, Gaudet D; RUTHERFORD-2 Investigators. PCSK9 inhibition with evolocumab (AMG 145) in heterozygous familial hypercholesterolaemia (RUTHERFORD-2): a randomised, double-blind, placebo-controlled trial. Lancet 2015;385:331–340. 40. De Backer G, Kastelein JJ, Landmesser U. The year in cardiology 2014: prevention. Eur Heart J 2015;36:214–218. 41. Kastelein JJ, Ginsberg HN, Langslet G, Hovingh GK, Ceska R, Dufour R, Blom D, Civeira F, Krempf M, Lorenzato C, Zhao J, Pordy R, Baccara- Dinet MT, Gipe DA, Geiger MJ, Farnier M. ODYSSEY FH I and FH II: 78 week results with alirocumab treatment in 735 patients with heterozygous familial hypercholesterolaemia. Eur Heart J 2015; 36:2996–3003. 42. Blom DJ, Djedjos CS, Monsalvo ML, Bridges I,Wasserman SM, Scott R, Roth E. Effects of evolocumab on vitamin E and steroid hormone levels: results from the 52-week, phase 3, double-blind, randomized, placebo-controlled DESCARTES study. Circ Res 2015;117:731–741. 43. Cederberg H, Stančáková A, Yaluri N, Modi S, Kuusisto J, Laakso M. Increased risk of diabetes with statin treatment is associated with impaired insulin sensitivity and insulin secretion: a 6 year follow-up study of the METSIM cohort. Diabetologia 2015;58:1109–1117. 44. Sabatine MS, Giugliano RP, Wiviott SD, Raal FJ, Blom DJ, Robinson J, Ballantyne CM, Somaratne R, Legg J, Wasserman SM, Scott R, Koren MJ, Stein EA; Open-Label Study of Long-Term Evaluation against LDL Cholesterol (OSLER) Investigators. Efficacy and safety of evolocumab in reducing lipids and cardiovascular events. N Engl J Med 2015;372:1500–1509. 45. Colhoun HM, Ginsberg HN, Robinson JG, Leiter LA, Mu¨ller-Wieland D, Henry RR, Cariou B, Baccara-Dinet MT, Pordy R, Merlet L, Eckel RH. Alirocumab effect on glycemic measures in patients without diabetes at baseline. Circulation 2015;132:A16863 (abstract). 46. Ginsberg HN, Farnier M, Robinson JG, Cannon CP, Sattar N, Baccara- Dinet MT, Lorenzato C, Bujas-Bobanovic M, Louie MJ, Colhoun HM. Effi cacy and safety of alirocumab: pooled analyses of 1048 individuals with diabetes mellitus from fi ve placebo-controlled Phase 3 studies of at least 52 weeks duration. Circulation 2015;132:A17070 (abstract). 47. Boekholdt SM, Hovingh GK, Mora S, Arsenault BJ, Amarenco P, Pedersen TR, LaRosa JC, Waters DD, DeMicco DA, Simes RJ, Keech AC, Colquhoun D, Hitman GA, Betteridge DJ, Clearfi eld MB, Downs JR, Colhoun HM, Gotto AM Jr, Ridker PM, Grundy SM, Kastelein JJ. Very low levels of atherogenic lipoproteins and the risk for cardiovascular events: a meta-analysis of statin trials. J Am Coll Cardiol 2014;64:485–494. 48. Robinson JG, Farnier M, Krempf M, Bergeron J, Luc G, Averna M, Stroes ES, Langslet G, Raal FJ, El Shahawy M, Koren MJ, Lepor NE, Lorenzato C, Pordy R, Chaudhari U, Kastelein JJ;ODYSSEY LONGTERM Investigators. Effi cacy and safety of alirocumab in reducing lipids and cardiovascular events. N Engl J Med 2015;372:1489–1499. 49. Benn M, Nordestgaard BG, Frikke-Schmidt R, Tybjærg-Hansen A. Low PCSK9 and LDL cholesterol and risk of dementia, Parkinson’s disease, and epilepsy—a Mendelian randomization study. Circulation 2015;132:A19109 (abstract). 50. EBBINGHAUS: Evaluating PCSK9 Binding antiBody Infl uence oN coGnitive HeAlth in High cardiovascUlar Risk Subjects. ClinicalTrials. gov Identifi er: NCT02207634. https://clinicaltrials.gov/ct2/show/ NCT02207634 (3 November 2015). 51. Yeang C, Witztum JL, Tsimikas S. ‘LDL-C’¼LDL-C+Lp(a)-C: implications of achieved ultra-low LDL-C levels in the proprotein convertase subtilisin/kexin type 9 era of potent LDL-C lowering. Curr Opin Lipidol 2015;26:169–178. Term Evaluation Against LDL-C (OSLER) randomized trial. Circulation 2014;129:234–243. 53. Navarese EP, Kolodziejczak M, Schulze V, Gurbel PA, Tantry U, Lin Y, Brockmeyer M, Kandzari DE, Kubica JM, D’Agostino RB Sr, Kubica J, Volpe M, Agewall S, Kereiakes DJ, Kelm M. Effects of proprotein convertase subtilisin/kexin type 9 antibodies in adults with hypercholesterolemia: a systematic review and meta-analysis. Ann Intern Med 2015;163:40–51. 54. SPIRE-1: The Evaluation of Bococizumab (PF-04950615;RN316) in Reducing the Occurrence of Major Cardiovascular Events in High Risk Subjects. Clinical-Trials.gov Identifi er: NCT01975376. https://clinicaltrials.gov/ct2/show/NCT01975376 (3 November 2015). 55. SPIRE-2: The Evaluation of Bococizumab (PF-04950615; RN316) in Reducing the Occurrence of Major Cardiovascular Events in High Risk Subjects. Clinical-Trials.gov Identifi er: NCT01975389. https://clinicaltrials.gov/ct2/show/NCT01975389 (3 November 2015). 56. FOURIER: Further Cardiovascular Outcomes Research With PCSK9 Inhibition in Subjects With Elevated Risk. ClinicalTrials.gov Identifier: NCT01764633. https://clinicaltrials.gov/ct2/show/NCT01764633 (3 November 2015). 57. ODYSSEY Outcomes: Evaluation of Cardiovascular Outcomes After an Acute Coronary Syndrome During Treatment With Alirocumab SAR236553 (REGN727). ClinicalTrials.gov Identifi er: NCT01663402. https://clinicaltrials.gov/ct2/show/NCT01663402 (3 November 2015). 58. Nordestgaard BG, Chapman MJ, Ray K, Borén J, Andreotti F,Watts GF, Ginsberg H, Amarenco P, Catapano A, Descamps OS, Fisher E, Kovanen PT, Kuivenhoven JA, Lesnik P, Masana L, Reiner Z, Taskinen MR, Tokgözoglu L, Tybjærg-Hansen A; European Atherosclerosis Society Consensus Panel. Lipoprotein(a) as a cardiovascular risk factor: current status. Eur Heart J 2010;31:2844–2853. 59. Tsimikas S, Hall JL. Lipoprotein(a) as a potential causal genetic risk factor of cardiovascular disease: a rationale for increased efforts to understand its pathophysiology and develop targeted therapies. J Am Coll Cardiol 2012;60:716–721. 60. Capoulade R, Chan KL, Yeang C, Mathieu P, Bossé Y, Dumesnil JG, Tam JW, Teo KK, Mahmut A, Yang X, Witztum JL, Arsenault BJ, Després JP,Pibarot P, Tsimikas S. Oxidized phospholipids, lipoprotein(a), and progression of calcific aortic valve stenosis. J Am Coll Cardiol 2015;66: 1236–1246. 61. Bouchareb R, Mahmut A, Nsaibia MJ, Boulanger MC, Dahou A, Lépine JL, Lafl amme MH, Hadji F, Couture C, Trahan S, Pagé S, Bossé Y, Pibarot P, Scipione CA, Romagnuolo R, Koschinsky ML, Arsenault BJ, Marette A, Mathieu P. Autotaxin derived from lipoprotein(a) and valve interstitial cells promotes infl ammation and mineralization of the aortic valve. Circulation 2015;132:677–690. 62. Raal FJ, Giugliano RP, Sabatine MS, Koren MJ, Langslet G, Bays H, Blom D, Eriksson M, Dent R, Wasserman SM, Huang F, Xue A, Albizem M, Scott R, Stein EA. Reduction in lipoprotein(a) with PCSK9 monoclonal antibody evolocumab (AMG 145): a pooled analysis of more than 1,300 patients in 4 phase II trials. J Am Coll Cardiol 2014;63:1278– 1288. 63. Gaudet D, Kereiakes DJ, McKenney JM, Roth EM, Hanotin C, Gipe D, Du Y, Ferrand AC, Ginsberg HN, Stein EA. Effect of alirocumab, a monoclonal proprotein convertase subtilisin/kexin 9 antibody, on lipoprotein(a) concentrations (a pooled analysis of 150 mg every two weeks dosing from phase 2 trials). Am J Cardiol 2014;114:711–715. 64. Romagnuolo R, Scipione C, Boffa MB, Marcovina SM, Seidah NG, Koschinsky ML. Lipoprotein(a) catabolism is regulated by proprotein convertase subtilisin/kexin type 9 through the low density lipoprotein receptor. J Biol Chem 2015;290:11649–11662. 65. Tsimikas S, Viney NJ, Hughes SG, Singleton W, Graham MJ, Baker BF, Burkey JL, Yang Q, Marcovina SM, Geary RS, Crooke RM, Witztum JL. Antisense therapy targeting apolipoprotein(a): a randomised, doubleblind, placebo-controlled phase 1 study. Lancet 2010;386:1472–1483. 66. Hegele RA, Ginsberg HN, Chapman MJ, Nordestgaard BG, Kuivenhoven JA, Averna M, Borén J, Bruckert E, Catapano AL, Descamps OS, Hovingh GK, Humphries SE, Kovanen PT, Masana L, Pajukanta P, Parhofer KG, Raal FJ, Ray KK, Santos RD, Stalenhoef AF, Stroes E, Taskinen MR, Tybjærg-Hansen A, Watts GF, Wiklund O; European Atherosclerosis Society Consensus Panel. The polygenic nature of hypertriglyceridaemia: implications for definition, diagnosis, and management. Lancet Diabetes Endocrinol 2014;2:655–666. 67. Chapman MJ, Ginsberg HN, Amarenco P, Andreotti F, Borén J, Catapano AL, Descamps OS, Fisher E, Kovanen PT, Kuivenhoven JA, Lesnik P, Masana L, Nordestgaard BG, Ray KK, Reiner Z, Taskinen MR, Tokgözoglu L, Tybjærg-Hansen A,Watts GF; European Atherosclerosis Society Consensus Panel. Triglyceride-rich lipoproteins and highdensity lipoprotein cholesterol in patients at high risk of cardiovascular disease: evidence and guidance for management. Eur Heart J 2011;32:1345–1361. 68. Rosenson RS, Davidson MH, Hirsh BJ, Kathiresan S, Gaudet D. Genetics and causality of triglyceride-rich lipoproteins in atherosclerotic cardiovascular disease. J Am Coll Cardiol 2014;64:2525–2540. 69. Gaudet D, Alexander VJ, Baker BF, Brisson D, Tremblay K, SingletonW, Geary RS, Hughes SG, Viney NJ, Graham MJ, Crooke RM, Witztum JL, Brunzell JD, Kastelein JJ. Antisense inhibition of apolipoprotein C-III in patients with hypertriglyceridemia. N Engl J Med 2015;373:438– 447. 70. Toth PP, Cannon CP, Kastelein JJ, Colhoun HM, Koren A, Louie MJ, Asset G, Rader DJ. Alirocumab LDL-C-lowering effi cacy in patients with moderate CKD. Circulation 2015;132:A17086 (abstract). 71. Zinman B, Wanner C, Lachin JM, Fitchett D, Bluhmki E, Hantel S, Mattheus M, Devins T, Johansen OE, Woerle HJ, Broedl UC, Inzucchi SE; EMPA-REG OUTCOME Investigators. Empaglifl ozin, cardiovascular outcomes, and mortality in type 2 diabetes. N Engl J Med 2015; 373:2117–2128. 72. Williams B, MacDonald TM, Morant S, Webb DJ, Sever P, McInnes G, Ford I, Cruickshank JK, Caulfi eld MJ, Salsbury J, Mackenzie I, Padmanabhan S, Brown MJ; British Hypertension Society’s PATHWAY Studies Group. Spironolactone versus placebo, bisoprolol, and doxazosin to determine the optimal treatment for drug-resistant hypertension (PATHWAY-2): a randomised, double-blind, crossover trial. Lancet 2015; doi: 10.1016/S0140-6736(15)00257-3. 73. Brown MJ, Williams B, Morant SV, Webb DJ, Caulfi eld MJ, Cruickshank JK, Ford I, McInnes G, Sever P, Salsbury J, Mackenzie IS, Padmanabhan S, MacDonald TM; British Hypertension Society’s Prevention; Treatment of Hypertension with Algorithmbased Therapy (PATHWAY) Studies Group. Effect of amiloride, or amiloride plus hydrochlorothiazide, versus hydrochlorothiazide on glucose tolerance and blood pressure (PATHWAY-3): a parallel-group, double-blind randomised phase 4 trial. Lancet Diabetes Endocrinol 2015; doi: 10.1016/S2213-8587 (15)00377-0. 74. Azizi M, Sapoval M, Gosse P, Monge M, Bobrie G, Delsart P, Midulla M, Mounier-Véhier C, Courand PY, Lantelme P, Denolle T, Dourmap- Collas C, Trillaud H, Pereira H, Plouin PF, Chatellier G; Renal Denervation for Hypertension (DENERHTN) Investigators. Optimum and stepped care standardised antihypertensive treatment with or without renal denervation for resistant hypertension (DENERHTN): a multicentre, open-label, randomised controlled trial. Lancet 2015;385: 1957–1965. 75. The SPRINT Research Group. A randomized trial of intensive versus standard blood-pressure control. N Engl J Med 2015 [Epub ahead of print]. 76. Nicholls SJ, Ballantyne CM, Barter PJ, Chapman MJ, Erbel RM, Libby P, Raichlen JS, Uno K, Borgman M, Wolski K, Nissen SE. Effect of two intensive statin regimens on progression of coronary disease. N Engl J Med 2011;365:2078–2087. 77. Nissen SE, Nicholls SJ, Sipahi I, Libby P, Raichlen JS, Ballantyne CM, Davignon J, Erbel R, Fruchart JC, Tardif JC, Schoenhagen P, Crowe T, Cain V, Wolski K, Goormastic M, Tuzcu EM; ASTEROID Investigators. Effect of very high-intensity statin therapy on regression of coronary atherosclerosis: the ASTEROID trial. JAMA 2006;295:1556–1565.